Today lobster is a luxurious food, but earlier it was considered as the food for lower members of society and servants. If fact, many poor people lived off of lobster. It was even served in prisons, despite the displeasure of inmates. The New Yorkers and Bostonians developed the taste for lobster in the mid of the 19th century. It was the time when lobster became popular. 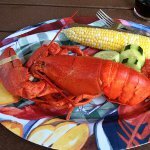 The most common way to cook lobster is to boil, bake, steam or grill it. We recommend you to try delicious lobster roll sandwich. You have to mix 1/2 cup of mayo, 2 teaspoons of Dijon mustard, 1/3 cup of diced celery, 1 tablespoon of fresh lemon juice and 1/4 teaspoon of Old Bay Seasoning. Mix the sauce well! Line 6 hot dog rolls with 6 leaves of lettuce. Spread cooked and cut lobster meat on lettuce and pour some sauce. This easy-to-make sandwich is great as a snack for a picnic.